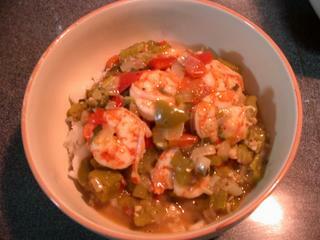 For some reason, I have always liked gumbo. I'm not even sure how I first came to know about gumbo since it is defintiely not on the menu at home. I think it might have come from one of my visits to my mum and she either cooked it in honour of some visiting friend or some visiting friend cooked it for us. Anyway, suffice to say I like gumbo. Something about it is just so comforting and warming. And I kinda needed that as I've been sick almost two weeks and am feeling as weak as a kitten. And my appetite had been off so I decided to cook today .. no matter how late I got home from cook. But first I needed to do major grocery shopping. My larder was starting to look so empty that I was making the Old Lady in the Shoe look well-stocked. And boy, shop I did! *Nods head sagely like Yoda* I bought so much groceries ... all healthy stuff ... that peeps in the supermarket were looking at me askance. One nice old man even asked me if I was planning a big dinner. LOL. Anyway, my fridge and larder are looking more respectable now and these should tide me for two weeks I think. I assembled the ingredients for my gumbo - it was already 9.45pm! Shite, at this rate I will not be able to finish till close to midnight as it takes more than an hour to cook. Sigh ... oh, well. I munched on an eclair that I bought from Ritz Apple Pie while I was assembling the ingredients and putting away all my groceries. It was kinda bizarre tasting. I'm quite traditional about my eclairs and like them with cream and even then just the normal, whipped cream variety, not even the choccie creams etc. This one was really odd - a cross between apple-flavoured cream and custard. Odd, very odd. It was tasty but the odd combo just threw me off. 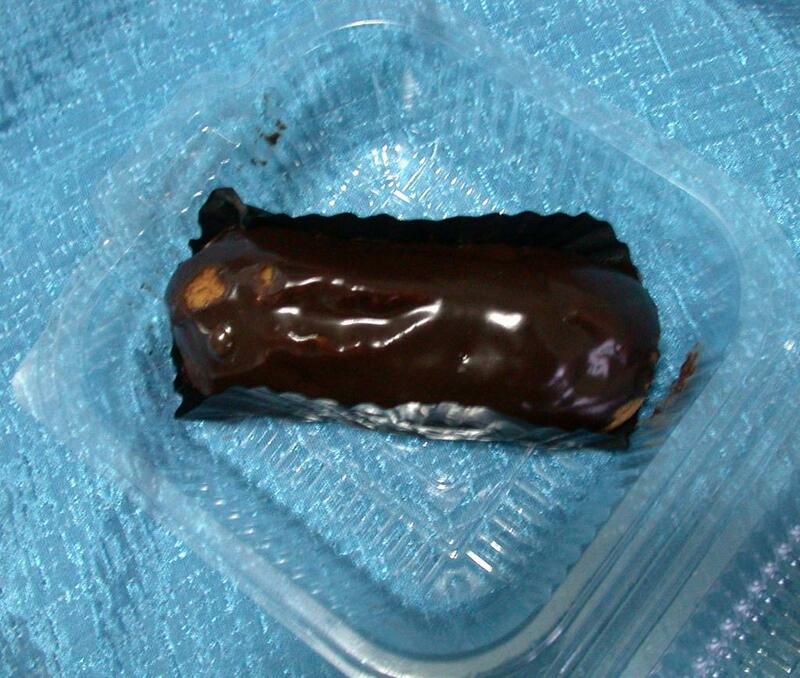 I think I prefer the Polar chocolate eclairs from near my office. The recipe called for the addition of eggs, which I thought was highly unusual. I'd never had gumbo with eggs before. 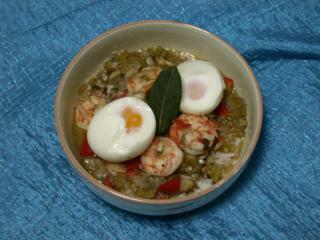 I noticed that it was supposed to be hard boiled eggs cooked in the gumbo whole. Odd. I wasn't too sure about that as I wondered about how tasty the dish would be be whole eggs. If they were cut up and added to the gumbo, that would add to the taste & texture but the yokes would disintegrate into the sauce in the 15-20 minutes cooking time required. But left whole, it was quite pointless. Hmmm ... I decided I would modify the recipe and make the eggs like Les oeufs modestes. i.e partially hard boiled but with the yoke still soft and runny, and added to the gumbo like a garnish instead of stewing it in the gumbo. 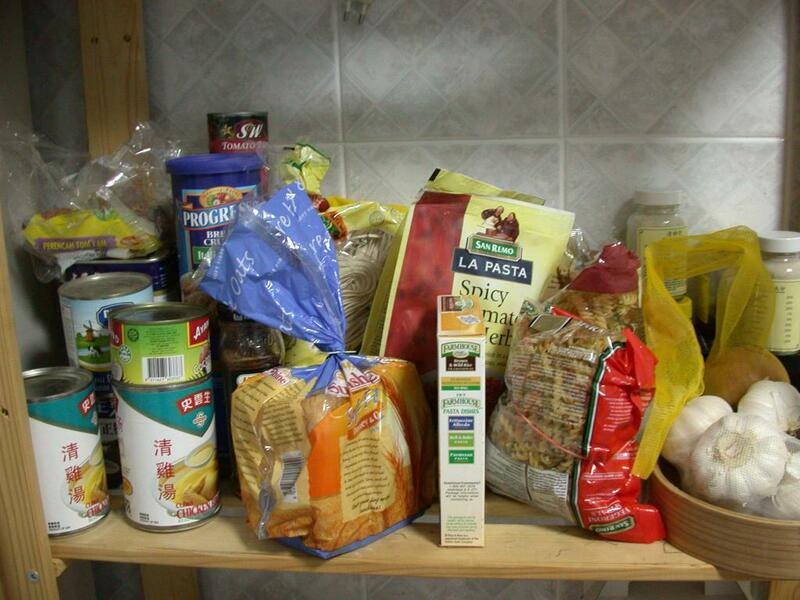 If you are cooking for one, you will find more than half lefttover. 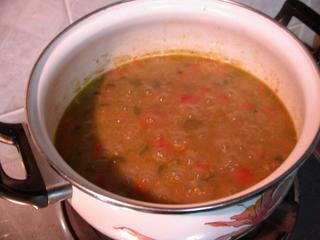 It is intentional as I want to keep this gumbo and have it for quick snacks, lunch etc. And gumbo always tastes much better the next day. Overall, this was not the most impressive gumbo recipe I've come across. I thought it was a bit bland and if I had not modified it so much, it would have been quite disappointing. The addition of the eggs was nice and I am glad I choice the direction I did as the runny yoke flowing over the green of the gumbo was not only visually appealing but tasted brilliant too. I rate this about 7.5/10 for taste and 8/10 for health because of all the vegetables in it. I will see if it improves in the taste ratings the day after. most interesting...need to consult you when you have time of course. for example..what is 'roux'? Roux, not to be confused with the jumpy blokes in Australia, is simply a thickening agent that you add to soups, stews etc, made up of flour & oil or butter. You cook the two together, stirring, till the roux becomes brown - like the name implies. In quite a few gumbo recipes, they ask for file to be used instead. However, I can't get file here in Singapore so I guess a roux is the next best alternative. 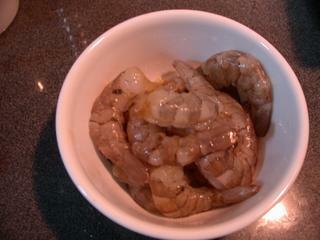 You really cannot miss this step as this is what makes your gumbo sticky and thick rather than a watery stew.